It’s sometimes hard to get the recognition you deserve when playing for one of the NHL’s top-scoring teams especially when you’re considered one of its grinders. When you’re skating with the Winnipeg Jets it’s natural somebody like Brandon Tanev will trail offensive teammates such as Blake Wheeler, Mark Scheifele, Kyle Connor and Patrik Laine on the squad’s scoring list. However, Tanev brings a lot more to the Jets than just goals and assists. The 27-year-old winger’s not doing too badly in that department with 11 goals and 20 points after 48 games while on pace for a 19-goal campaign. Tanev’, who hails from Toronto, Ontario, has never really been a high-scoring sniper or playmaker throughout his career and that’s probably why he went undrafted. He played four years with Providence College and racked up 35 goals and 42 assists for 77 points in 149 games. This included the game-winner to capture the national championship in his last year. Tanev made an impression on the Jets’ scouting staff while playing at school and they offered him a contract in March of 2016. He was thrown into the deep end shortly after and played three NHL games with the team near the end of the 2015/16 season. 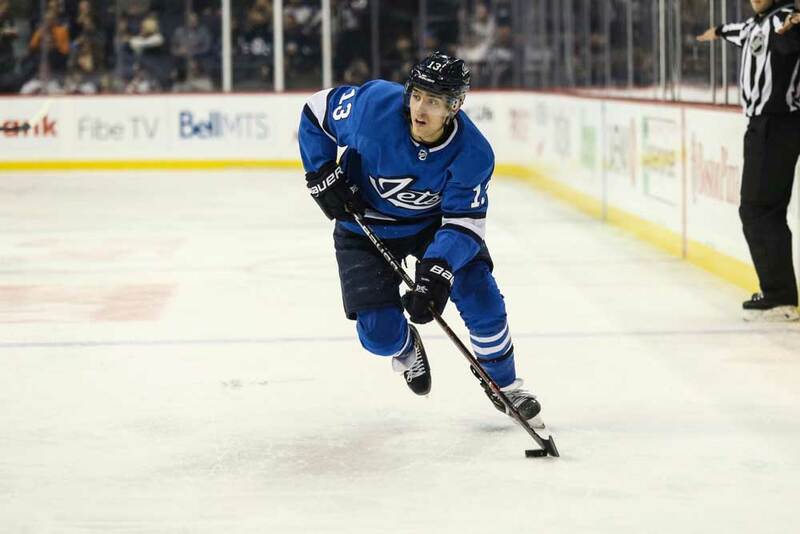 Most Jets’ fans had probably already forgotten about him when the 2016/17 schedule faced off, but he managed to play 52 games with the big club while spending the rest of the year with the Manitoba Moose of the AHL. Tanev scored a pair of goals and added a couple of assists for just four points in Winnipeg and the team failed to make the playoffs. Last season saw Tanev play in 61 games and chip in with 10 goals and eight assists while adding four goals and a pair of helpers in 17 playoff outings. Because of his tireless work ethic and lunch-pail attitude, Tanev’s ice time increased by two minutes per game last year and he’s skating an additional two minutes this season for an average of 14:19 a night. He’s not flashy by any stretch of the imagination, but has become one of the organizations most valuable players. In fact, Tanev’s just what the doctor ordered if the team hopes to take a serious run at the Stanley Cup. Tanev’s new-found scoring touch has definitely helped out as he’s being rewarded for driving to the net and then loitering around the crease once he gets there. The career-high in goals haven’t gone to his head though as he’s still somebody who likes to spend his ice time in the dirty areas of the rink. Tanev’s presence is usually made known due to his speed and aggressive forechecking style. He’s an accomplished penalty killer when tasked with the job by head coach Paul Maurice and takes pride when asked to help shut down the opponent’s top line. And although he’s not a huge physical specimen at six-feet tall and 180 lbs, Tanev is always fighting for the team lead when it comes to hits and blocked shots. The way he plays the game has impressed Jets’ players and coaches as he’s gained their respect. This doesn’t mean all the team’s fans feel the same way though. There’s been several instances of grumbling from supporters who question Tanev’s ice time over more naturally-skilled players on the depth chart. Some of those critics have been muted after Tanev’s seven points in his last 10 games though. There are also those who wonder just how long Tanev will last in Winnipeg. This is basically due to his fine play and the fact he’s making just $1.15 million this season before becoming an unrestricted free agent. General manager Kevin Cheveldayoff and Maurice will definitely want to keep him, but it’s unclear what the cost will be. The Jets’ salary-cap space is mainly spoken for next season already even if it does rise by a few million dollars. They also need to re-sign restricted free agents Connor and Laine as their entry-level deals are about to expire. In addition, Jacob Trouba and Andrew Copp will also be restricted free agents. This will be another tough decision for an NHL general manager and there are dozens of similar scenarios around the league. There are numerous players who are pending unrestricted free agents in the summer and GM’s need to decide if they should trade them before the deadline, attempt to re-sign them or simply let them walk. Tanev is the type of player every team needs to be successful and there are plenty of clubs who may inquire about his services before the trade deadline. But with Winnipeg having a legitimate shot at the cup it’s unlikely they’ll upset the apple cart and deal him. Therefore, the odds of Tanev remaining in Winnipeg seem to be about 50/50 right now. He could definitely receive a considerable salary boost by testing the free-agent waters and will also be able to command an increase if he stays with the Jets. Tanev has carved out a pretty good NHL career for himself as a small power forward through sheer determination and hard work. Suddenly finding something of a scoring touch this season has been a bonus. With Winnipeg taking a chance on the undrafted player three years ago he’d probably like to repay the club by re-signing with them. Of course, the catch-22 with Tanev is the better he plays the more attractive he becomes to other teams. And the more valuable he is, the tougher it will be for Winnipeg to pay him his true worth.